Standardization of the health IT backbone involves a series of processes following a shared set of norms—from content definition to transport definition to algorithmic definition—which can lead to better patient outcomes, improved safety, better access, and reduced cost, by repeatedly using the best available knowledge. For example, the aviation industry offers a model showing how a culture focused on safety, supported by standard communication terminology and technology, and extensive use of checklists, can result in low accident rates, with 2017 the safest year to fly on record. According to the Aviation Safety Network, there were no commercial passenger jet deaths in 2017 and a total of 10 fatal airliner accidents—including cargo planes and commercial passenger turbo prop aircraft—with 44 fatalities onboard and 35 people on the ground. The fatal accident rate of commercial aviation is one per 16 million flights. Imagine if we had similar stats for engaging with the healthcare system. Medical errors are the third leading cause of death in the US, with over 250,000 deaths per year, according to a recent study by John Hopkins, and our own open source "Killer Truths" research. Of course, unlike machines, the complexity and variability of humans requires personalized care. Here then, are a series of steps to build beyond current efforts for standard data and incrementally move towards standardized care. The first step in achieving standardized care is to create a common language for clinicians, patients, and healthcare systems. Miscommunication and errors can result when different healthcare providers, or different medical records, collect similar types of data with wildly different syntax. Most health IT schemas—like ICD and SNOMED—are not free and open, but rather, licensed commercially. This adds a wrinkle to the push for standardization, as patients will have difficulty owning their data if the vocabulary of description is not open and co-owned. Standardized measurements establish a repeatable and consistent way of evaluating the quality of collected data and measuring outcomes. For example, a standard measurement of readmission rates for cancer patients specifies the timeframe, age, and type of facility, which should be captured in the same way from every clinic, every time. The combination of standard measurements and data facilitates the exchange of information between all parties. 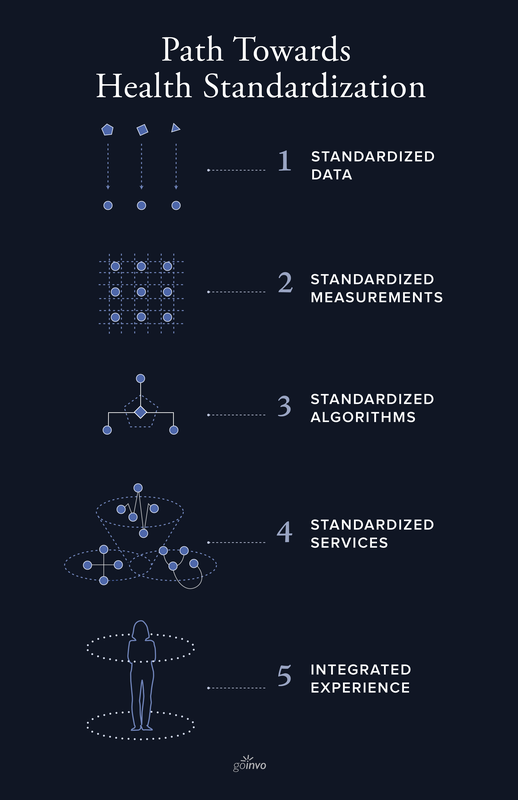 Standard algorithms build upon standard data and measurements by providing consistent results when given certain inputs in order to recognize patterns and make predictions. The benefit of this is that clinicians and patients are guided to follow up-to-date best-practices to make decisions and have consistent results from decision support tools and tests. Importantly, when considering standardized algorithms, we need to be able to audit the mechanisms that drive care. These include creator biases, system biases, and unintended engineered biases. AHRQ CDS is tricky. For example, if a cholesterol treatment CDS cites three separate studies from three separate universities, how do you distribute ownership? That IP issue needs to be sorted out and codified. Standardized services integrate a family of algorithms with clinical practice guidelines to drive care. For example, a lab test involves multiple steps, starting from chief complaint to evaluation to administration of the test, and followed by multiple types of analysis, and consultation about the results. Standardized services include not only guidelines for interpretation but also for clinical and patient experience. The aggregate of a patient’s health record encompasses multiple encounters with multiple care teams. Orchestrating insights from a longitudinal health record requires coordination by a digital service driven by standardized management algorithms. This digital health care service or health data manager will actively manage health data and care in a timely, accurate, repeatable, and patient friendly manner. The healthcare system is only at the beginning stages of undertaking standardization. Healthcare actively resists standardization because existing systems are too often tribalistic in nature. Doctors, understandably, want to use what they've invented and experienced versus what others have statistically proven. This is a very human trait. But healthcare can not afford locally grown, finger in the air outcome management. We need statistically proven, repeatable care modeling, so we can get closer to 99% diagnosis rates. This will require standardization, and doctors and machines working together. Interested in digital healthcare strategy and user experience design?Drop us a line at info [at] goinvo [dot] com. Or use our contact form.